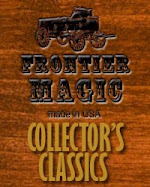 MAK Magic Blog: Frontier Magic gets the point! July is turning out to be a great month for magic! The Society of American Magicians meet for their annual convention in Atlanta and the International Brotherhood of Magicians Convention took place in San Diego, California. There has been some talk about the upcoming “Essential Magic Conference”. Everyone is wondering, “Could this be the way of magic conventions in the future?” We will have to wait and see! Speaking of talking, we have been talking a lot about Frontier Magic lately and for good reason. 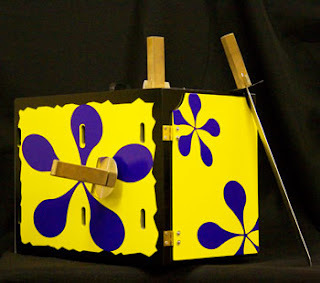 These folks have built some exceptional magic for us such as card boxes, Electric Sawing Thru Neck, the Benton and Foxes Nest of boxes and the Bunny Bucket as well as other classic magic. Recently, the team has been working on a MAK Magic original bringing a new look and affordability to the old standard. I am speaking of the new Dagger Head Chest. If this looks familiar, it should. The Dagger Head Chest is an economic version of the classic Murder, Inc! This new incarnation is wood constructed. You still get metal daggers as with Murder, Inc. You still get the great effect of pushing fifteen separate daggers in the box containing your helper’s head. You still make your helper’s head vanish, just at a more reasonable cost! Instead of a base, Frontier has added a detachable handle for support, making it easy to set up and pack. The new graphics give it a retro look that could be a call back to the old Mystery Machine on the Scooby Doo shows of the eighties, making it great for a kids show. This effect does not use BLACK ART! This is a great entry-level illusion for anyone wanting to get into stage magic. Check it out! As with all Frontier Magic, it’s made in America.